This is a popular 4 bedroom floor plan. It is the best price around. Why is it the best price around you ask? Simple. Because it needs paint and flooring and the seller doesn't want to do all that. So seller's loss is buyer's gain. Just don't bring your picky buyer that wants everything in place as you will waste your time. 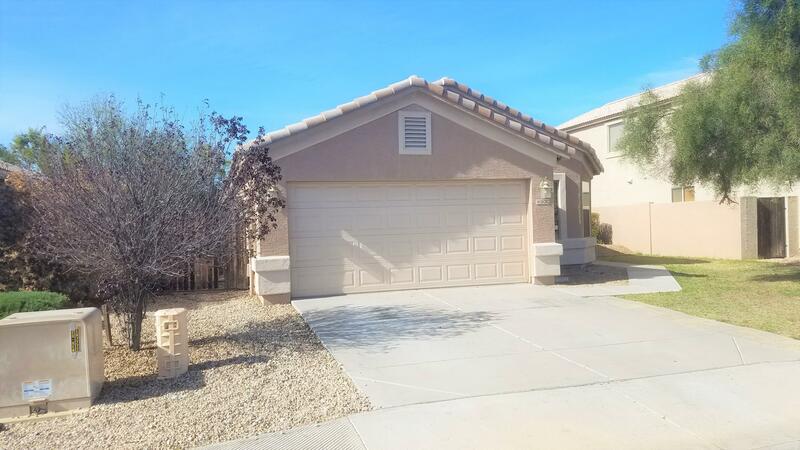 It has vaulted ceilings throughout, some ceiling fans, 2 full bathrooms, a big walk-in closet in the large master bedroom, a garden tub, a separate shower and double sinks in the master bathroom. The kitchen has lots and lots of cabinetry and overhead ceiling lights. Washer, dryer and refrigerator are included. The location is quiet and has a quiet, private back yard with a covered bAck patio. Block wall fencing.